Coffee makes the world go round, or at least gets it up and lurching about. If you're a coffee fan and want to turn this basic beverage into an espresso art form, the Gaggia Classic may be a great option. It is designed to do just a few crucial things extremely well: It heats water, brews coffee under pressure for great espresso crema, and froths and steams milk. In this Gaggia Classic review we will unfold the set up to see how simple it is to use, how well it's built, and if it can help you build terrific barista skills. Who Is The Gaggia Classic For? The Gaggia Classic is built for those who want to enjoy espresso and espresso-based coffee drinks. It will work with espresso pods, with fine ground coffee, and coffee with an espresso grind. While there is a espresso tamper to use with fresh espresso ground coffee, you don't have to have a great grinder to get started with the Gaggia, thanks to the variety of professional grade filter baskets available. The Gaggia Classic is heartily built at just over 20 pounds but doesn't take a great deal of counter space. If you want to learn more about the art of coffee, this machine can whip up your desires with a bit of practice. The Gaggia Classic works by forcing very hot water through coffee under pressure. You can amend your beverages with frothed milk for a luscious treat. It should be noted that this is an extremely hands-on machine that is set up to brew into espresso cups. If all you have are coffee mugs, you will need to at least invest in a couple of small cups or low containers to fit on the cup tray. 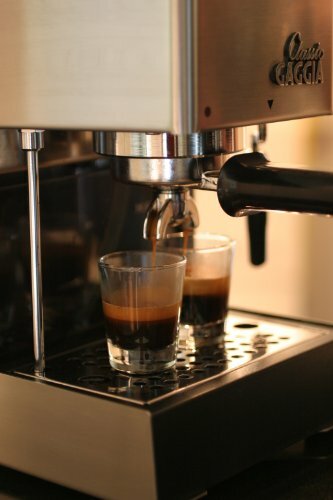 ​No muss, no fuss espresso with loads of rich crema can be easily made with your Gaggia Classic. Simply choose your coffee format (pods, ground or fresh ground) and select the filter most appropriate for your beverage. Please note that espresso pods are not hard plastic containers of beverages as found in Keurig-style machines, but are soft-sided filter containers of finely ground coffee. 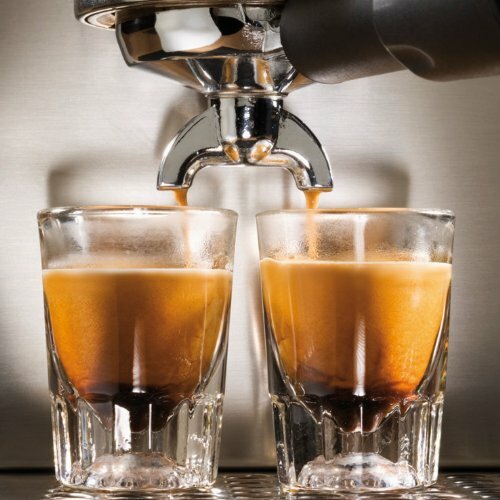 Once your espresso is made, you can amend it with milk and make either a cappuccino (1 part milk to 1 part espresso) or a latte (2 parts milk to 1 part espresso). This will require the use of your steam wand, which will froth and warm the milk. A properly built cappuccino has a lot more foam on top than a latte. The nice thing about making your own espressos and lattes is that you get to play with the milk foamer, and even your mistakes will be quite tasty! 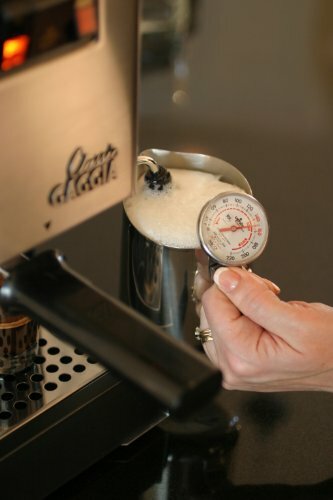 The Gaggia Classic Steam Wand is extremely easy to set up and use. There are three buttons at the top of your espresso maker that will enable you to heat the water either for coffee or to create steam through your frother. There are detailed instructions on how to set the machine up for frothing, how to steam milk, how to clean the steam wand and how to remove the steam pressure and, if you choose, use the steam wand as a hot water dispenser. Steam can be dangerous. The combination of heat and pressure can result in painful burns. Be sure to watch the setup and instructional videos, so you learn how to clear the steam wand safely! There is a filter basket ideally designed to use untamped fine grind coffee for coffee. Also, you can use the steam wand as a hot water dispenser for hot water for tea. The milk frother can also be used to heat milk. This hot milk can then be amended with a simple sprinkle of cinnamon or with a hot cocoa mix. SEE ALSO: What is a cortado? Do not add a beverage mix to your milk before heating or steaming. Coating the steamer wand with sugar will make it extremely hard to clean. Once you've learned the features of this machine, you can use it for a variety of hot beverages. Only two products have to go into this machine to make a tasty coffee drink: you need coffee and filtered water. The accessories to accompany this machine help kick the basics up a notch. ​The water reservoir can be removed and filled, or you can fill it from the top. It's critically important that a new user watch the instructional videos! They are put together to give the user a step by step set of instructions, from opening the box to priming this machine to brewing your first cup of lush espresso. When adding water to the machine or managing hot water as it leaves the reservoir, pay special attention to the water handling tubes that feed the pump. These tubes are very flexible for easy maneuvering of the reservoir but can get turned up rather than lowered into the standing water in the reservoir. Again, watch the videos for any troubleshooting instructions. The steam wand is easy to put together and easy to clean. The aerating cover can be easily removed to clear away hot milk and keep the steam flowing evenly. ​There are three different filter baskets to handle both ground coffee and pods. Thanks to the filtration capabilities and pressure tolerances of each of these baskets, crema is lush and easy to achieve. Each basket has its own purpose and produces the best results in the best circumstances. For example, you don't always have to tamp your espresso grind if you use the right basket. It is recommended, though not necessary, that you use fresh ground coffee from a quality burr grinder. A good espresso maker and a burr grinder can be quite an investment for even the most dedicated coffee fan. If you've invested in an espresso maker and are planning to buy a burr grinder, please know that this machine will make espresso both with pre-ground coffee and with espresso pods. The Gaggia Classic Espresso Machine comes with multiple removable filter baskets to produce a great cup of espresso. There is a single portafilter holder that locks into the machine and three attachments that will snap down into it. These attachments will work for soft espresso pods, for fine ground coffee, and for fresh espresso-grind beans. The tamper included with the Gaggia is made of hard plastic, which some coffee fans prefer to replace with a stainless tamper. Tampers help you build crema on your cup of espresso. Freshly roasted and freshly ground coffee releases CO2, and this light brown foam rises to the top of your cup as the espresso brews. The tamper is the tool that allows you to compress the coffee down into the filter basket. It helps the pressurized coffee build more crema. The Pannarello Steam Wand that comes with your Gaggia Classic is designed to produce extremely fluffy, frothy milk. It produces an extremely intense spray of steam for best milk volume. You can also purchase an extra latte arm with which you can create patterns in the milk foam at the top of your drink. Steaming milk brings out the natural sweetness. If you like coffee shop quality espresso, but don't care for the hyper-sweetness of many drinks on the menu, learning how to froth milk can help you reset your palate for the simple sweetness of milk. Like any milk frother, the Pannarello Steam Wand will need to be cleaned, so milk residue doesn't clog things up. If you notice that your milk is heating but not frothing, experts with Whole Latte Love offer great troubleshooting tips on keeping your steam wand in the best working order. The Gaggia Classic has some very tight tolerances. Like any finely tuned machine, it will need regular maintenance to keep it producing the very best coffee. The recommended cleaning product is the Gaggia Decalcifier as recommended by the manufacturer. There are many recommended methods of descaling a coffee maker. One of the simplest ways is to use white vinegar and water. While this may work extremely well on a $50 coffee maker, owners of the Gaggia understand that this machine is an investment, not just a coffee pot. Don't risk your espresso maker with a cheaper cleaning option. Use the manufacturer recommended product. You can save yourself a great deal of cleaning hassle by using filtered water in your machine. Many contaminants and minerals that will clog up a coffee maker are easily avoided with a good filter or source of filtered water. While you'll still need to descale the Gaggia Classic on a regular schedule (think of this as an oil change), you'll have less mineral build-up to fight if you use filtered water. Final Thoughts - Worth A Buy? The Gaggia Classic semi-automatic espresso machine is an excellent tool for making the very best version of coffee: a concentrated, lush cup of espresso. If you're ready to bump up your coffee habit from a basic cup of homebrew to a tiny cup of amazing espresso, or if you yearn to learn to make cappuccino and lattes, the Gaggia may be a great choice.